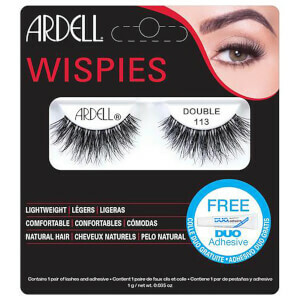 Intensify your peepers with Ardell's 105 Lashes. Lightweight and reusable, the long, full and fluttery false lashes are perfect for day or night, and lend your lashes ample volume and length. They are set on an invisible band that connects the hair strands to form a strip that ensures secure corners. Perfect for adding extra length and definition. Made with natural hair and easy to apply. Shape: Large eyes. Deep set eyes. Contains one pair of lashes and adhesive. 1. Check Fit: Lay lash on top of your natural lash. If it extends beyond your lash line, trim the excess with small scissors. 2. Apply Adhesive: Squeeze a thin line of LashGrip Adhesive along the lash band. A toothpick can be used to spread it evenly. Wait about 30 seconds for adhesive to set. 3. Apply Lash: Place the lash as close to your natural lash line as possible. Use your fingertip to gently press along the band to secure in place. i really liked the lashes, they were as expected.